50 years of production. These bars direct the power from the wheels to the ground efficiently. Traction-Master Bars are technically superior and historically correct for all performance cars built in the 1950s, 1960s, and 1970s. Shelby American installed Traction Masters for the GT-350s. Sunbeam Tigers were also factory-equipped with our original bars. Hot Rodders continue to use Traction-Master Bars with the same passion. A strong performer that is historically correct to the period. causing axle hop and traction loss. Traction-Masters eliminate leaf spring wrap up. The dual pivots still allow normal leaf spring up and down movement. 1> Carries the weight of the car. Leaf springs work reliably well, but are bad as control arms. 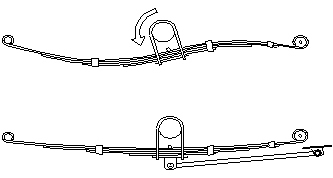 Hard acceleration or braking causes the springs to twist and wrap up which changes the axle position. Traction is lost and also causes additional wear on U joints, the leaf spring, shock absorbers, and suspension bushings. Traction-Masters allow the leaf to act as a spring, but relieves it's axle-locating responsibilities. Traction is improved and equalized, and you will also find a noticeable improvement in braking. Conventional Slapper type bars only work during acceleration and rely on the binding up of the rear suspension to function. Slapper bars can also degrade handling and have no effect on brakings. Each genuine Traction-Master has our unique M1 cast end. These ends make a stronger bar that handles the most severe torque without distortion or splitting. steel tubing. (Since Jan 2000). The smaller and thinner tube on the right is an substandard copy. and maximum strength. MAG gases enables optimum fusion with characteristics of moderate to high weld metal deposition rates. cast polyurethane with exacting tolerances.